Do you want maximum exposure and visibility online on major social networks with a social media marketing program that doesn't break the bank? Did you know that most businesses spend 4 to 6 hours a week managing social media (although they could be using that time running their business)? 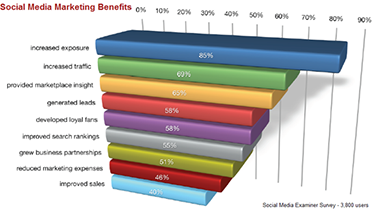 Did you know that marketing programs are 63% more effective when combined with social media? "It's great to have oGoing as our social media marketing partner. brand and online presence, and attracts new entrepreneurs and business owners to our programs." oGoing promotes your business, organization or non-profit through your beautiful oGoing profile or social network profiles, posts timely sales updates, builds online visibility and generates quality website traffic. oGoing attracts and engages new customers through frequent interactions, and jumpstarts new leads and online sales using social media marketing, social sharing and social bookmarking. oGoing guarantees real results and promises outstanding ROI on our services. oGoing Team has been delivering social media and integrated digital marketing services, and making our customers happy for over seven years now! Why choose oGoing for managing your social media? * Please note that company creates the social network profiles on Facebook, Twitter, LinkedIn and Google+. oGoing can help setup these profiles for an extra setup fee. * Company will provide content to oGoing team for the posts and blog articles. Company will provide access to oGoing team to various social network profiles. oGoing Inc. All rights reserved. 7545 Irvine Center Dr., Suite 200, Irvine, CA 92618. www.ogoing.com oGoing is USA's leading Local Small Business Network.